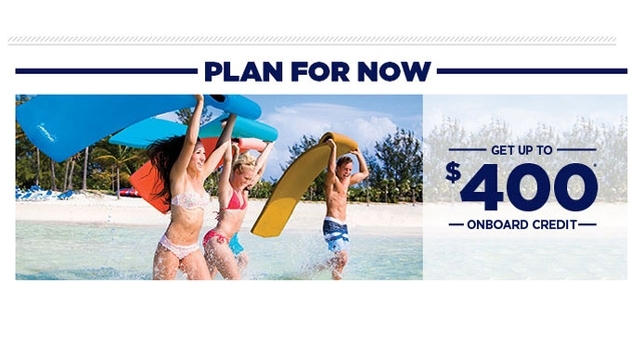 The care-free days of summer are right around the corner, and Royal Caribbean International is ushering them in with an onboard credit promotion that offers vacationers booking a cruise vacation from May 7- 31 up to a $400 credit. Excited travelers can choose from any six-night or longer sailing departing to the Caribbean and Bahamas between July 1 and December 31, 2014. For those vacationers looking ahead and booking a holiday season cruise the cruise line is doubling their onboard spending credit. For more details, please visit http://www.RoyalCaribbean.com/MayWow. There’s no better way to escape the day-to-day grind and refocus on quality family time than on a Royal Caribbean cruise, where guests will sail aboard the industry’s most innovative ships that offer an expansive array of exciting itineraries. While enjoying their cruise guests can use their bonus spending credit to book an adventurous family shore excursion, a specialty dining experience to celebrate a family milestone, or commemorate the occasion with the perfect family portrait. The offer applies for all new U.S. and Canadian bookings made from May 7 - 31, 2014, for sailings departing from July 1 through Dec. 31, 2014. Vacationers will receive $50 onboard credit per interior or oceanview stateroom; $100 onboard credit per Jr. suite or stateroom with balcony; and $200 onboard credit per Grand Suite or higher category stateroom. As an added incentive, the cruise line is also doubling onboard credits up to $400 for all eligible sailings between Dec. 15 and Dec. 31, 2014. The offer is valid fleetwide, excluding Quantum of the Seas.